Children are very prone to accidents and it is important that any sort of injuries are treated properly. When you are a parent, you’ll want to help them get through their pain as soon as possible but how can you do this if you don’t know how to properly perform first aid? If you’d like to know more about how you can help your child with their cuts, burns and sprains, keep reading our basic first aid tips below. Before we get started on our tips, you must first understand the importance of a proper first aid kit. Medical first aid kits can be purchased online that provide you with everything you need to help your child with their injury. 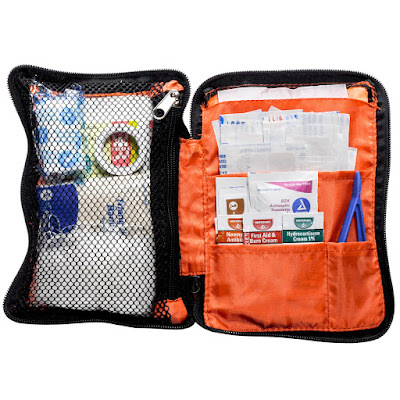 You’ll need to make sure that you have all of the important first aid items in your kit. This includes things like plasters, bandages, pins, wipes and tweezers. Make sure to keep your first aid kit restocked so that you are covered in an emergency. If your child likes to run about outside, it is likely that they fall and cut themselves quite often. This is normal for all children and you need to remember that the bleeding will stop in a few minutes. To stop the bleeding, you should apply pressure for around 5 to 10 minutes. You should then clean out the wound using water and make sure that there is no dirt or stones etc in the wound. After this, you can apply some antibiotic ointment and then cover it with a plaster or bandage. This is fairly simple, but you should always remember to clean out the wound! A strain happens when a muscle is stretched or torn. If this happens to your child, they’ll likely complain of soreness and there might even be some bruising or swelling for a while. For the more serious injuries, known as sprains, ligaments might have been torn and so it is likely to take a little longer to heal. You should always check carefully the severity of the pain and if you suspect a sprain, you should go to see a doctor to get the problem fixed as soon as possible. To help treat an accident like this at home, you should make sure that your child rests the affected part of their body. You should then add ice to reduce the swelling. After this, you can use a bandage or a splint to compress the area and prevent any sort of swelling from happening. You should always make sure that the strain is elevated so that it is above your child’s heart. If you follow this advice, you’ll be able to react more quickly to any sort of accidents that might happen when you are at home or out in a park somewhere. Make sure to always have a stocked up first aid kit and you’ll be ready for any sort of medical emergency.